album but with his own electric ride. which he plans to drive to Washington, D.C. With Fork In The Road as current as today's headlines, the controversial and mad-as-hell Neil Young is still rockin' the free world and once more is taking the road less traveled. 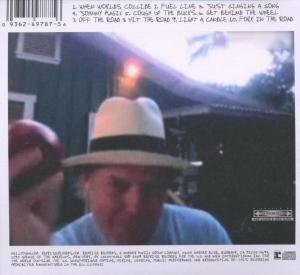 2009 release from Rock 'N' Roll Hall of Famer Neil Young, who is stirring things up again. This time, he is rolling on down the road not only with an auto-centric concept album, but with his own electric ride. Fork In The Road, whose largely eco-car-themed songs he debuted in concert during the past yeare, will get a promotional push from the 1959 Lincoln Continental Young has converted to hybrid technology and which he plans to drive to Washington, D.C. With Fork In The Road as current as today's headlines, the controversial and mad-as-hell Neil Young is still rockin' the free world and once more is taking the road less traveled. If Fork In The Road had been released instead of Reactor back in the early 80's, it would have been hailed as a masterpiece, a worthy sequel to the grunge-fest of Rust Never Sleeps. But this is nearly 30 years later, and what was cutting edge then is cliche today. Still, not all is wrong with predictability. Before Young begins singing on each song, you can often anticipate the melody line he'll use -- they're standard Young melodies that Neil is not about to ditch any more. He's recylced this music so often that there's a considerable element of familiarity in most Young fans before they've even listened to the first track. This has its pros and cons. If you fight it, it's a con. Neil won't change at this stage. If you accept it, it can be a pro. The material falls within stylistic expectations and the only question left is: Does Neil retread the same old ground with quality songs, or is he merely going through the motions? This time around, it's the first. You may have heard Fork in countless variations on previous Young albums, and yet his old tricks are still effective when done well and given a twist. Of course, this also adds to the rushed and tossed off feel of some of the tunes, which can bring a certain charm to Neil's work. And that's frequently been the feeling with many of his tunes, even his classic ones. The following albums are strongly alluded to: Reactor, Rust Never Sleeps, On The Beach, Comes A Time, and a touch of Hawks And Doves and the more shadowy side of Stars And Bars. Not that Fork is as brilliant as some of these, it's just that they are the source from which Neil borrows to make Fork (blatantly sometimes). Quite a different concept altogether. There is, however, one major difference or addition to the old recipe. This is a grungy and yet LITE album that, as many reviewers noted, would be cool for cruisin' around. While it may have all the grunge you want, it has little of the grunge darkness (unlike Greendale). And that's an interesting combo which permeates the entire album, making it snappy, foot-tapping, and well-crafted, if undemanding as well. Then there's some clever riffing and imaginative and well chosen color changes within most songs (in fact, the title track is probably the lamest of the heavy ones). And to top it off, the production is wholly unassuming, allowing the raw vigor of the band to come through -- simple, hard-hitting, and forward-looking. All this makes Fork relevant and Neil's most pleasant surprise in decades. As for the CD, it's pretty fabulous in and of itself. At this point on his life journey Neil Young is out of control and utterly, absolutely, on a roll. And no doubt about it, he's going somewhere. Every song is about something automotive, going down the road, going somewhere. it's all about my world. Yup, we're definitely going somewhere. All of this is delivered in a wall of sound that's tight like never before for Young and some of the best rock to come along in a long, long time. And the haunting strains of the steel guitar on Light a Candle are sure to make the hair stand up on the back of your neck every time. All this is to say that Fork is a great piece of work by a living legend who never ceases to amaze. After the line "Somebody spoke and I went into a dream", Young grins impishly. In producing the wild crescendo of sound to end the song the old codger goes berserk, tearing the strings off his battered Les Paul and grinding them against the pickups to create an otherworldly roar before stalking off the stage. A driving album - kind of. Well it's generally about driving and some of the songs are ideal for that long drive. But it is a mixed bag of songs, some are standout (Just Singing a Song was probably my favourite) but there are one or two others that are not that memorable. Neil at his best! A "Theme" compilation, regarding the Green Movement. The perfect companion for a long road trip in your car! Appropriately named, Neil Young is indeed still "Young". In fact, just like fine wine, he just gets better with age! This is "New" Neil Young, and IT IS GOOD! This Album (CD) has a theme, and the music ROCKS! Neil is seeing the nascent changes taking place in our country and in the world. Each song in the entire album (CD) has some relationship to either the past or the "New" future, specifically related to changing from fossil fuel to new energy sources, especially battery. In his song "Fuel Line" he mentions a B 16 battery. How many who are reading this have any idea of what is a B 16 battery? Neil has been doing his homework! In his song "Singing A Song": "Just singing a song won't change the world. You can ride in my car, see how it rolls, feel the `NEW ENERGY' as it `QUIETLY' goes. You can be what you try to say while the big wheel rolls". She goes a long way on "DOMESTIC" green fuel 100 miles a gallon is the Continental rule. In his song "Cough Up The Bucks": This is an direct statement explicitly stating that we need to "Pay" for fuel at whatever price the implicit "Supplier" of that fuel wants. It also implies, that they have complete control over us and if we want to drive, then "Cough Up The Bucks". This becomes apparent with the words "Where did all the money go?" and "It's all about my car". In his song "Hit The Road": ...bumper to bumper in a giant cloud of fumes...trying to find the energy to stay in the groove." In his song "Light A Candle": "Instead of cursing the darkness, light a candle for where we're goin'. There's something ahead worth looking for. When the light of time is on us, we will see our moment come, and the living soul inside will carry on". My interpretation is that we should not be complaining with the high prices at the pump (cursing the darkness), but instead focus on making changes (light a candle for where we're going). Then he goes on to say that we will "See our moment come", and the living souls will carry on" which of course is self explanatory. In his song "Fork in the Road: The words berate people receiving the "bailout money" from Uncle Sam and at the same time Neil expresses feelings about himself. "There's a bailout coming but it's not for me. It's for all those creeps watching tickers on TV. (Also, he sings, "Not for you. It's for all those creeps hiding what they do"). About how he feels about himself: "I'm not done. Not giving up. Not cashing in. ..."I'm a big rock star. My sales have tanked, but I still got you. Thanks! " ALL RIGHT NEIL! For people like me who remember the "FEELING" of the 60's and our "IDEALS" there is a new "MOVEMENT" happening! Things are changing! We did it once, and we can do it again...and keep in mind, with age comes wisdom, so... we did great last time, and I think we will do even better THIS TIME! Take a ride with Neil at the wheel. On this road trip with Neil you will meet some interesting characters like Johnny Magic. For those Neil young fans with high expectations for this CD don't worry your expectations will be met. Like all of Neil's music these songs are deeply meaningful and emotional. These are a lot of songs here that make poignant statements and a couple to just listen to, clear your mind and enjoy the beauty of the music. Some of the songs on this cod will remind the listener of the Reactor CD\album especially "When worlds collide", "get behind the wheel" and "Just singing a song". I can't pick a single favorite song because they are all so good. When worlds collide is a real rocker, "Fuel line" is about auto manufactures claiming to be green. "Just singing a song" and "Johnny Magic" both rockers (could this be Johnny Rotten re invented?). "Get behind the wheel" this song has a nice bluesy feel to it. "Off the road" is a slower song with a nice melody to it. "Light a candle" is the most romantic song on the cod - very nice. "Fork in the road" bluesy rock and roll (I am reminded of Steve Ray Vaughn and Double Trouble on this one). As with all of Neil's studio recordings the music is wonderfully mastered and engineered. Neil and the people that work with him put a lot of heart and soul into this recording. I can't speak highly enough of this CD. Buy it and play it. Neil Young has had a long and distinguished career, so if he has a couple of misses along the way, one can hardly blame him. On this album the singer has good intentions, but should have spent more time editing his lyrics and fleshing out his melodies. "When Worlds Collide" and "Just Singing a Song" are the strong points, but "Fuel Line," purportedly about green fuel, really strikes me as a paen to the corn lobby--which is generally anti-green, their rhetoric about biofuels aside: indeed, extracting ethanol from corn yields so little net energy compared to extracting it from sugar cane (produced largely in foreign countries such as Brazil and Cuba--the large-scale purchase of which is not cost-effective due to the high tariffs erected to protect the small quantities produced in Louisiana), that the line "she burns domestic green instead" could be construed as an anti-environmental statement, or at least one that indicates that whereas Neil Young is not owned by the oil lobby, he is in the pocket of another sort of big corporation: corn. Download this....sounds like...well, sound great. Ok, I was only about 6 months old when Woodstock happened, but I grew up listening to the music of my (6-8 year) older siblings. I grew up reading linear notes on album jackets, reading the names and connecting the dots as I recognized artists collaborating with each other. During my senior year in high school, while my peers were listening to Dokken or "Van Hagar", I was jamming to Warren Zevon's "Sentimental Hygiene". Neil's rough guitar growling in the background. Oh sure, I'd knew who Neil Young was, but was only vaguely familiar with his solo material. This is music the way I like it - raw, foot-tapping, thumb-drumming on my desk, volume loud enough so my phone goes to voice mail, each song leads to a warm and welcoming place in my normally cynical head. Thank you Neil for this album. I'll pick up my guitar (which has been collecting dust for two years now) and try to play along with this magic that comes from my "apple" red Sansa Fuze. Thank you Iowa Public Radio for grabbing my attention and giving me something new to listen to! It's albums like this that reassure me that there are still singer-songwriters out there that make music in which my attention can be immersed, and for a moment, life is a happier place. I'm a big NY fan, but his last few efforts have left me a little cold. This one strikes me as "product." Nothing really stands out and like I said in the title, it sounds like it was thrown together in a hurry. The cover art work is a good indicator - were those photos taken with a Kodak Pocket 110? Godfather of Grunge still kicking sonic @ss! Neil Young is plugged into the muse. He has left us an enormous legacy of great music for his fans to enjoy. Add another to the list with Fork In The Road. He has been reinventing himself with rapid frequency over the many decades of his career, a tip of the hat to Dylan. He has left many fans scratching their heads. But those of us who love Neil's unpredictable music know that for every weak song there are a bunch of gems. His creative streak has become a torrent. After a brush with death in 2007, he came up with Prarie Wind, Living With War, Chrome Dreams 2, and now Fork In The Road. This artist is optimistic about the future and the album is upbeat. Neil put his money where his mouth is and developed an electric car that gets 100MPH from a converted heavy old Lincoln Continental. That car might change our world. He got so fired up about it he wrote a bunch of great songs. But heck, he could probably write a great topical album about belly button lint or whatever caught his eye! I might have plagiarized that last line. The album is infused with inspired lyrics and catchy riffs. Neil offers up some fresh new rock and roll, chock full of current events and themes that matter. My favorites are "Fuel Line" and "Johnny Magic" (a tribute to his lead car tech on the electric car project), and "Light A Candle." Like many of my favorite Neil Young albums, this one came together quickly. If you liked Living With War or Mirrorball or even Freedom, you'll like this one too.